I don’t actually recall how/when I first encountered Ñāṇavīra’s writings. So, I can’t say how they struck me at the time. But I can say that for a while–a good many years, in fact–they basically defined the Buddha’s teaching for me. What purpose, exactly, did these amazing and unique documents fulfill in my thinking? First, they directed me to the suttas and away from that which would interpret them for me (think the Commentaries) or pretend to supersede them (the later schools, Mahayana, etc). And while my range in Buddhism has broadened considerably since then, I still think that if your interest is to know what the historical Buddha said this is a healthy attitude to have. If it’s just any kind of spiritual thought or practice you’re after, there are a great many out there to satisfy you, but if your intention is to get to know Shakyamuni Buddha, the Pali canon (but not all of it!) is where you’ve got to go. All others are pretenders and wannabes. So Ñāṇavīra pointed me to the original texts. But he also, to my mind, illuminated them like nobody else ever has. In his writings there is a combination of integrity, clarity, rigor and exactness that is rarely found in spiritual writing, even the best. The man had a first rate head on his shoulders, a wry wit, and the writerly chops to get it all across in the best style possible. Not to mention the fact that he wrote from actual meditative attainment (i.e. sotapatti, meaning stream entry) and so knew first hand something of the Buddha’s teaching and how the texts related to that attainment. Another notable aspect of Ñāṇavīra’s writings is his relating of the Buddhist suttas to twentieth century European philosophy—specifically existentialism and phenomenology. This is not to say he thought Sartre & Co had somehow discovered the Dhamma on their own, but rather he noted that their perspective on the human situation mirrored the Buddha’s own position to an uncanny degree and so, for many Westerners at least, might offer a door in to the Stream. I think there is little to argue about in this regard–that is, the case, I’d say, is pretty well proven. So those who come to the Buddha’s teaching from an existentialist or phenomenological position might find more that is familiar than they would expect. Ñāṇavīra pointed this out to me, and through this understanding I found myself adopting a different attitude with a consequently greater appreciation for the existentialists.Beyond mere intellectual illumination though there is also Ñāṇavīra’s wrestling with questions of life and death. He lived, for the better part of a decade, with ill health, chronic discomfort, and the prospect that his solitary enterprise as a Buddhist monk might be go down to defeat on account of intestinal parasites. As a result, his writings discuss with startling matter-of-factness the possibility of his death by suicide on this account, and what such a death might mean within the context of Buddhadhamma. As one reads, the omnipresent possibility—indeed, inevitability—of his end weighs in the background, lending a degree of drama.But what about the contents? What comprises this unique text? Clearing the Path has been described as a “workbook,” and it is certainly is that. You should know though that it is not a single piece, but consists of one major original work—Notes on Dhamma, written to illuminate certain critical terms in the suttas–and a slew of letters to correspondents who came to Ñāṇavīra with questions about life, the Dhamma, and the meaning of it all. One piece, entitled Fundamental Structure, is rather forbidding and opaque–something like a mathematical proof. Readers are advised to leave it for last and not to get their hopes up too high as for understanding it; I confess I grasped portions, but large swathes escaped me. Which leads me to my one cautionary note: this book is for advanced Dhamma students only. People unfamiliar with basic Pali terminology and/or Buddhist thought will be hopelessly lost. I should also add it is not, primarily, a meditation manual; its principle thrust is the philosophical under girdings of the the historical Buddha’s thought as it is found in the Pali Canon of the Theravada school. If you’re looking for some other Buddhist school, this will not be your cup of tea. Existential philosophies, then, insist upon asking questions about self and the world, taking care at the same time to insist that they are unanswerable. Beyond this point of frustration these philosophies cannot go. The Buddha, too, insists that questions about self and the world are unanswerable, either by refusing to answer them or by indicating that no statement about self and the world can be justified. But—and here is the vital difference—the Buddha can and does go beyond this point: not, to be sure, by answering the unanswerable, but by showing the way leading to the final cessation of all questions about self and the world. Let there be no mistake in the matter: the existential philosophies are not a substitute for the Buddha’s Teaching—for which, indeed, there can be no substitute. The questions that they persist in asking are the questions of a puthujjana, of a “commoner,” and though they see that they are unanswerable they have no alternative but to go on asking them; for the tacit assumption upon which all these philosophies rest is that the questions are valid. They are faced with an ambiguity that they cannot resolve. The Buddha, on the other hand, sees that the questions are not valid and that to ask them is to make the mistake of assuming that they are. One who has understood the Buddha’s Teaching no longer asks these questions; he is ariya, “noble,” and no more a puthujjana, and he is beyond the range of the existential philosophies; but he would never have reached the point of listening to the Buddha’s Teaching had he not first been disquieted by existential questions about himself and the world (from the Preface). At the time I read [Joyce’s Ulysses]—when I was about twenty—I had already suspected (from my reading of Huxley and others) that there is no point in life, but this was still all rather abstract and theoretical. But Ulysses gets down to details, and I found I recognized myself, mutatis mutandis, in the futile occupations that fill the days of Joyce’s characters. And so I came to understand that all our actions, from the most deliberate to the most thoughtless, and without exception, are determined by present pleasure and present pain. Even what we pompously call our “duty” is included in this law—if we do our duty, that is only because we should feel uncomfortable if we neglected it, and we seek to avoid discomfort. Even the wise man, who renounces a present pleasure for the sake of a greater pleasure in the future, obeys this law—he enjoys the present pleasure of knowing (or believing) that he is providing for his future pleasure, whereas the foolish man, preferring the present pleasure to his future pleasure, is perpetually gnawed with apprehension about his future. And when I had understood this, the Buddha’s statement, “Both now and formerly, monks, it is just suffering that I make known and the ceasing of suffering” (M.22:38), came to seem (when eventually I heard it) the most obvious thing in the world—“What else,” I exclaimed, “could the Buddha possibly teach?” (pp. 404-5). Suffering (dukkha) is the key to the whole of the Buddha’s Teaching, and any interpretation that leaves suffering out of account (or adds it, perhaps, only as an afterthought) is at once suspect. The point is, that suffering has nothing to do with a tree’s self-identity (or supposed lack of self-identity): what it does have to do with is my “self” as subject (I, ego), which is quite another matter… As I point out…, “With the question of a thing’s self-identity (which presents no difficulty) the Buddha’s Teaching of anatta has nothing whatsoever to do: anatta is purely concerned with ‘self’ as subject.” But this is very much more difficult to grasp than the misinterpretation based on the notion of flux, so flux inevitably gets the popular vote (like the doctrine of paramattha sacca, of which it is really a part). The misinterpretation is actually of Mahayanist origin; and in one of their texts (Prajñaparamita) it is specifically stated that it is only on account of avijja that things appear to exist, whereas in reality nothing exists. But the fact is that, even when one becomes arahat, a tree continues to have a self-identity; that is to say, it continues to exist as the same tree (though undergoing subordinate changes on more particular levels—falling of leaves, growth of flowers and fruit, etc.) until it dies or is cut down. But for the arahat the tree is no longer “my tree” since all notions of “I” and “mine” have ceased (p. 175). Anguttara Nikaya Anthology: An anthology of discourses from the Anguttara Nikaya selected & translated by Nyanaponika Thera & Bhikkhu Bodhi. Buddhist Publication Society 2007. 245 pages. I thoroughly enjoyed and heartily recommend this short, punchy and eminently readable selection of passages and suttas from the Anguttara Nikaya, one of the five main “baskets” of texts making up the Pali Sutta Pitaka of the Theravadan school. The translation by Nyanaponika Thera (BB’s mentor) was originally published in the BPS Wheel Series in three volumes. Bhikkhu Bodhi has cleaned up this translation, as well as added extensive (and quite helpful) endnotes. The result is the most accessible Anguttara Nikaya available for non-Pali readers. Readers should be aware that this is in no way an attempt at a complete translation. In many cases, only a paragraph or two has been kept from any given sutta, and from the final “Chapter of the Elevens” only one text (a snippet of a sutta) was included. Obviously then, there will be many passages that people might hope to have found that will not be here, as the choice of what to put in and what to leave out has been entirely a matter of personal inclination (specifically Nyanaponika’s). What I perhaps most appreciated about this book was its high number of practice oriented texts. Too often Buddhist philosophy can seem remote or technical, and for those that find philosophy in the abstract too…well…abstract, this should be a welcome addition to the personal library. There are lots of passages here one can easily write down and stick in the wallet, or pin next to the computer, to remind and encourage oneself. And ultimately, this of course is what it is all about–how to make ourselves better, more conscientious and conscious human beings. Wisdom Publications has received Bhikkhu Bodhi’s new translation of the Anguttara Nikaya, which is currently being reviewed by our editor. Any available information or updates on this project will be announced in the Wisdom Reader e-Newsletter (from the Wisdom Publications website). The Connected Discourses of the Buddha: A New Translation of the Samyutta Nikaya by Bhikkhu Bodhi (2 volumes). Wisdom Books 2000; 2074 pages. I think Bhikkhu Bodhi read and considered every criticism levelled at his previous offering, The Middle Length Discourses of the Buddha, and determined to make darn sure he didn’t have to hear those criticisms again. The result of his enterprise is an extremely detailed and careful treatment of the second largest collection in the Sutta Pitaka, the Samyutta Nikaya. For this post I’ll first discuss briefly the place of the SN in Pali literature, and then give an overview of how BB has treated it. Along with the Digha, Majjhima, Anguttara and parts of the Khuddhaka Nikayas, the Samyutta Nikaya comes from the oldest strand of Buddhist texts, and is thus critical if one wants to have any hope of determining what the historical Buddha actually taught. It got its name from the fact that its various parts (called vaggas) are made up of suttas that tie directly to one another in terms of their format (the particular pattern or “template” they display) and subject matter. The resulting vaggas are characterized by their focus on, for example, verse sayings, or discourses on dependent arising, the aggregates, the sense bases, the eightfold path, or some other critical doctrinal point. There are also sections devoted to talks by and with certain individuals, famous and not so famous, such as Anuruddha or Channa or Samandaka. The Samyutta Nikaya is thus at once very heterogeneous in the range of topics it covers, but also much more systematically organized than, say, the Majjhima or Digha Nikayas, where subject matter takes a back seat to other concerns. This makes it very easy to locate suttas on specific issues one is interested in, but it also has the effect of making many of the suttas sound monotonously similar, to the point where it’s often tempting to skip ahead upon encountering–for the umpteenth time–the same iteration of terms one just read through a few pages back. As a result, BB has had to do a lot of condensing and made extensive use of ellipses, and indeed, because the suttas seem to bleed into and repeat one another, the tradition itself does not have a solid count of how many individual suttas make up the nikaya. The consensus seems to be around 2,900, give or take a couple dozen. As noted, BB’s translation is thorough. To give you an idea how thorough, I counted about 480 pages of endnotes! Now many of these are of interest only to philologists, but many more add significantly to the text in the form of traditional commentarial materials, as well as BB’s own insights into the text. He also is careful to note which sources he is using, as the various redactions from Burma, Sri Lanka or the PTS don’t always agree with one another. This is something he was specifically criticized for not doing on the Majjhima Nikaya, so I think scholars in the audience will have fewer bones to pick this time around. In addition to the general introduction, each vagga also gets its own intro, where its particular themes are further discussed; I especially found his intro to the Khandhavagga illuminating. (I quoted from it in my essay on Christian Buddhism.) All in all Bhikkhu Bodhi has put an enormous amount of effort into this project and I’m starting to think that Buddhists all over the world owe him a medal or something. Regarding the text proper: as I’ve said with previous reviews of translations, I am not a Pali scholar so am not in a position to critique him on specific word choices–except, perhaps, important doctrinal terms. In most cases his translations of such terms are quite standard and unexpected, though I was pleasantly surprised by his rendering of sakkaya not by the traditional “personality,” but as “identity.” I think this is an improvement and brings increased clarity and accuracy to important terms like sakkayanirodha or sakkayaditthi. The text, as a whole, is highly readable, beautifully presented, and does the best it can with the already noted copious repetitions. Any translator of Pali has to deal with this issue and there are only so many ways of doing it. I think BB has respected the text’s integrity by preserving what needed to be preserved, by artful use of ellipses, and by leaving enough so one can reconstruct any particular passage from the clues on hand. And yet, we still have two weighty volumes! In the Buddha’s Words: An Anthology of Discourses from the Pali Canon, edited and introduced by Bhikkhu Bodhi. Wisdom Publications 2005, 485 pages. This is the most recent of several Pali-only anthologies of Buddhist texts I’ve read, the other two being Word of the Buddha and Path To Deliverance, both by the famous German monk Nyanatiloka. (The latter is especially good.) This one is easily the most comprehensive. For those of you who find the suttas tough going on account of their lack of thematic organization, this book will be a godsend. As Bhikkhu Bodhi explains in the introduction, the idea for it had its genesis in a series of lectures he gave on the Majjhima Nikaya. His goal therein was to arrange materials from simplest to most profound, giving a progressive, graded course of theoretical and practical instruction. He then decided to turn that approach to the Sutta Pitaka as a whole. The result is the present work. Each of these sections is prefaced with a substantial introduction by Bhikkhu Bodhi, and some of these are surprisingly good. (I have often felt a little sour toward BB’s writing because he is such a slave to the Commentaries and tends to express himself with a slightly stilted, pompous air.) I was especially impressed by his introduction to part 3 (“Approaching the Dhamma”), which is, in effect, an essay on the place and nature of faith (saddha) in the Buddha’s teaching. I think anyone, no matter how knowledgeable, can benefit from these pages (81ff). It is especially useful as a contrast to Christian notions of faith. So who would benefit most from this book? I think beginning students would especially be served by it, or at least those who have until now subsisted mainly on a diet of secondary texts and haven’t yet plunged into the jungle of the suttas. This book is excellent for providing an orientation, and if read two or three times so that one really becomes familiar with the passages contained therein, when the passages are finally encountered in their full form it should prove very rewarding. But then, anyone who wants a refresher, or a different manner of presentation from, say, the four noble truths and the three-fold training (sila, samadhi, paññā), will also benefit. 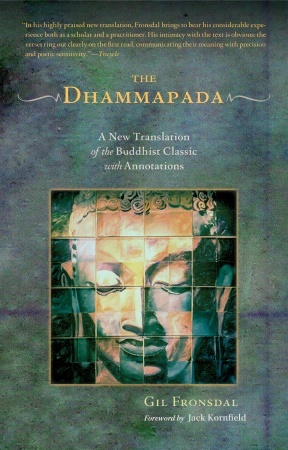 The Dhammapada: A New Translation of the Buddhist Classic with Annotations translated by Gil Fronsdal. Shambhala 2006, 152 pages. The first two pages of the preface to Gil Fronsdal’s translation say it all: Fronsdal lays out the challenges a translator of an ancient text faces. He talks about the Dhammapada’s history in English, about how “a translation mirrors the viewpoint of the translator” (pp. xi-xii)–something Easwaran never did. Most pointedly, he notes that “Hindu concepts appear in English translations done in India” (p. xii)–or by a Hindu, I might add. (Hint: think Easwaran.) He goes on to say (p. xii) “In this translation, I have tried to put aside my own interpretations and preferences, insofar as possible, in favor of accuracy.” I believe he has done exactly this. The Dhammapada originated in a time, culture, and spiritual tradition very different from what is familiar to most Western readers today. We might be alerted to this difference if we compare the beginning of the Dhammapada with the opening lines of the Bible, which emphasize God’s role as Creator and, by extension, our reliance on God’s power. In contrast, the first two verses of the Dhammapada emphasize the power of the human mind in shaping our lives, and the importance and effectiveness of a person’s own actions and choices… Ethical and mental purity [he goes on to say]…cannot be achieved through the intervention of others: “By oneself alone is one purified” (verse 165). How different this is from Easwaran’s constant–and fatuous–comparisons to Jesus and, even, Albert Einstein. The remainder of Fronsdal’s introduction looks at its contrasting emotional moods–“energy and peace”–its themes, and the effects reading it have had on him. Fronsdal again demonstrates his penetration of basic Buddhist teachings when he writes on page xxix “[I]t is not the world that is negated in the Dhammapada, but rather attachment to the world (as in verse 171).” In the margin of my copy I scribbled Yes! In other words, Fronsdal gets it–which is not so surprising when you consider the man has trained in both the Soto Zen and Theravadan traditions, has a Ph.D. in Buddhist Studies from Stanford, and is a teacher at Spirit Rock Meditation Center. In other words, he has every qualification needed to interpret the Buddha’s teaching, qualifications Easwaran seemed to have but in fact was sorely lacking. Anyway, on to the text proper. Despite my above praise, Fronsdal does make some interpretations I thought odd, though this is not to say I didn’t understand his reasoning. For example, the title of the Dhammapada’s first chapter, usually rendered as “Twin Verses” or “Paired Verses,” Fronsdal names “Dichotomies.” Fortunately, he explains this and other such choices–which he (much to his credit) acknowledges as controversial–in detailed end notes signified by asterisks. (This was another problem I had with Easwaran’s text–I could not tell which verses his end notes pertained to unless I went to the back of the book.) This is much appreciated; one important characteristic of any good translator is candor and clarity as to what sort of interpretive choices s/he makes and why. Fronsdal maintains high standards in this regard; he explains his choices in detail in the end notes, and having done so the reader can then appreciate that while some of his word choices are unorthodox, they are not without merit or insight. I realize not every reader will be interested in such linguistic and terminological details, but they need to be discussed somewhere if the translator is to maintain legitimacy. As for the reading experience of Fronsdal’s Dhammapada: it has the spare, poetic feel I am familiar with from other translations of Pali Buddhist texts. Also, as previously noted, he does seem to fulfill the aspiration he stated in the preface–that of producing a relatively literal translation, one reflecting its original time and place as opposed to the layers of (mis)interpretation that later commentators and cultures have often imposed on the text. As a result, Fronsdal’s translation feels definitively like a Buddhist text, one that should be instructive to any newcomers to the Buddha’s Dhamma. I hope they will leave it wanting more. The Dhammapada introduced & translated by Eknath Easwaran. Nilgiri Press 1985/2010, 275 pages. The Dhammapada, the best known and most widely read of Buddhist scriptures, is like an appetizer. By tasting it you can get a hint of the delights to come, though it will not fill you. Ideally, it ought to make you want more–more knowledge, more understanding. It should lead you on. The trouble is, so many stop with it, assuming they’ve understood. The Dhammapada is like that. It is deceptively simple and so very easy to agree with. Who, after all, regardless of creed, could take issue with the following? Avoid all evil, cultivate the good, purify your mind: this sums up the teaching of the Buddhas (183). I once had a discussion with a man of the Baha’i faith who had read the Dhammapada and as a result came to the conclusion that Buddhism and Baha’ism taught one and the same thing. The argument got rather heated, for while I said No he said Yes, for the notion that “all religions are one,” that all great spiritual persons are messengers of God, is a fundamental tenet of the Baha’i religion. The Hindus, too, hold to this–never mind what the Buddha is recorded to have said on the subject. Which brings us in a roundabout way to Eknath Easwaran’s translation. Mr. Easwaran’s credentials–as noted in my previous post–are impeccable, so I ventured into his book with high expectations. It starts off with an 85 page introduction and is padded throughout with commentary. (Except for the introduction, all commentary is from the pen of Stephen Ruppenthal, who according to selfgrowth.com is an expert in the fields of Chinese and Sanskrit Buddhism.) I certainly have no problem with commentary, provided of course it’s substantive and offers some insight into the text I might not otherwise have gotten. Easwaran starts with some background history of India before the Buddha’s arrival on the scene. What he broaches here is pretty rudimentary, but his many references to Jesus and then Einstein started to make me uncomfortable. Why? Well, it is a popular, New-Agey sort of thing to try to wrap up every great person in the same bag–never mind their disparate fields and backgrounds–as if they’re all in cahoots with each other, teaching the same thing. Whether or not one believes this is actually the case is beside the point. Dragging a twentieth century physicist and Biblical figures into a discussion of the Dhammapada does nothing to illuminate the text. It would have been far more informative, for example, if the Dhammapada’s place in Buddhist literature, history and culture had been elaborated upon. But even this much is never done. More worrisome than Jesus and Einstein, though, was Easwaran’s insistence on using Sanskrit terminology in his discussion of the Buddha’s teaching. Given that the Dhammpada is originally in Pali, I saw no reason that the Pali terminology could not have been used. To me it bespoke an ideological bias or, even worse, a subtle, perhaps unconscious, condescension. The statement (on page 26) that the Buddha “stands squarely in the tradition of the Upanishads” is very misleading. In fact, we are not certain which if any of the Upanishadic teachings he had direct contact with. That some of the Upanishads had come into form prior to his time is certain; that some evolved after him is also certain. Whatever the truth of it, there is no doubt the Buddha’s philosophical stance is at odds with that of the Upanishads and this, as much as anything else, is what has delimited Buddhism from what later became Hinduism. Concerning the Buddha, Easwaran writes (on p. 27): “Meditation…he offers to teach to all…as a way to happiness, health, and fulfillment in selfless service.” Um…no. The Buddha constantly enjoined his disciples to seek out solitude, to shun attachments and burdensome affiliations in the pursuit of mental culture through meditation. He most certainly was not a social activist. This is Easwaran’s Gandhi-esque influence coming through. “…he is loved today…by perhaps one quarter of the earth’s people” (p. 27). If only this were true! Latest estimates place Buddhists in the range of 350 million to a wildly optimistic one billion worldwide. No matter where in that range you plant your flag, Easwaran’s estimate is a pipe dream. On page 62, when the Buddha is nearing death, Easwaran sticks the following words into his mouth: “But, Ananda, you must know that I will never leave you. How can I go anywhere? This body is not me. Unlimited by the body, unlimited by the mind, a Buddha is infinte and measurless, like the vast ocean or canopy of sky…” If I wore dentures, I’m sure they would have fallen out at this point. For in fact the Buddha said something very nearly the opposite. In the Mahaparinibbana Sutta, the source text for the scene, he says “Ananda, have I not told you before: All those things that are dear and pleasant to us must suffer change, separation and alteration? So how could this be pssible? Whatever is born, become, compounded, is liable to decay–that it should not decay is impossible.” T. S. Eliot’s words in “Burnt Norton” seem especially applicable to Easwaran: “Human kind cannot bear very much reality.” From this point on I knew I was dealing with a translator who had a very definite–and very un-Buddhist–agenda. “The Buddha’s dry description of the four dhyanas hides the fact that traversing them is a nearly impossible achievement” (p. 67). Not true! Though certainly difficult, the jhanas (dhyanas) are not beyond the attainment of the average person, given sufficient application, good health, and supporting circumstances. Easwaran’s statement is nothing but sensationalistic. His discussion of the first four meditative absorptions (jhanas) (pp.67 ff) is way off, both textually and in terms of how these states are actually experienced. Most egregiously, on page 74, he seems to equate the experience of third jhana with bodhi, i.e. enlightenment, which it most certainly is not. The Buddha time and again made clear the jhanas are conditioned states and that their attainment is not particular to his path. Easwaran drives off a cliff when, still in the context of the third jhana, he evokes the Yogacarin “storehouse consciousness” (ālayavijñāna) and Jung’s “collective unconscious”–all on the same page! By this point in my reading I knew I was dealing with an incompetent. It gets worse. His discussion of karma (p. 76) is incoherent. He equates the third jhana with mystical “oneness” (p. 77), and on page 78 says of fourth jhana “this is nirvana” (OMG!). He invokes Mahayanist doctrines of intrinsic purity and true nature (pp. 79, 96 et al) and says (p. 80) that the Buddha “loved the world as a mother loves her only child.” (Apparently he had not read the suttas.) He repeats (p. 95) nonsense from the Milinda Panha concerning what is reborn (“neither the same nor another”) and alleges that “Pali is a vernacular descendant of Sanskrit” (p. 100). This is patently false. Here is Bhikkhu Bodhi on the nature of Pali’s origins: “Scholars regard this language as a hybrid showing features of several Prakrit dialects used around the third century BCE, subjected to a partial process of Sanskritization. While the language is not identical with any the Buddha himself would have spoken, it belongs to the same broad linguistic family as those he might have used and originates from the same conceptual matrix” (Bhikkhu Bodhi, In the Buddha’s Words. Wisdom Publications, 2005, page 10). I think you get the picture. And this is just the introduction! In short, Easwaran has authored a cataclysm of errors and sentimentality. A word on Ruppenthal’s contribution: he, too, gives birth to numerous doozies of distortion. For example: p. 121 muddles a discussion of nirvana; his understanding (p. 130) of the anagami is totally wrong; the Buddha is alleged to have been Hindu (p. 138); chapter twelve on self wallows in ambiguity; I could go on and on. In short, Ruppenthal’s commentary, like Easwaran’s introduction, is a toss. If you know your stuff and read it, you’ll either laugh or cry. If you don’t know your stuff, you’ll just be misled and come away with all sorts of deluded misunderstandings about what the Buddha really taught. I’ve already written far more than I usually would for a book review and I haven’t even gotten to the translation proper. Fortunately other reviewers on Amazon have already covered this aspect adequately well–see, e.g., Shigeki J. Sugiyama’s review. Basically, if you compare Easwaran’s translation to those of others you will see he is amazingly free in his interpretations, to the point where fidelity of meaning is suffering like an old man with a case of the ague. At points it hardly qualifies as translation. And this is not surprising, for nowhere in the book does Esawaran actually talk about translation per se–what his standards were, his intentions, how reliant he was on the commentaries, which commentaries, etc. In other words, this version of the Dhammapada is really the Dhammpada according to Easwaran. It is not the Buddha’s; it is hardly Buddhist. The only thing good I can say about it is that thanks to Easwaran’s natural literary talents the text is highly readable, even poetic. Kudos to him on language and expression. Okay. I think I’ve railed enough. The Middle Length Discourses of the Buddha: A New Translation of the Majjhima Nikaya by Bhikkhu Ñanamoli & Bhikkhu Bodhi. Wisdom Publications 1995, 1412 pages. Note: I was notified by a reviewer on Amazon that there have been two revisions, quite substantial, since this edition. The most recent is from 2005 and is apparently much improved. It is, however (I am finding), difficult to get! My review below applies only to the original 1995 edition. For my review of this translation I decided to take a different tack. Since I am not a Pali scholar I am not qualified to critique Bhikkhu Bodhi’s (or Ven. Ñanamoli’s) translation, so I thought I would turn to someone who is–namely, L.S. Cousins of the University of Manchester writing in The Journal of Buddhist Ethics (Vol. 4, 1997). For anyone wanting to go further than my summary of his major points, you can find his review here. Cousins criticizes the title, specifically the word “new,” since most of the translation was done by Ñanamoli in the 1950s, not by Bhikkhu Bodhi in the 1990s. Indeed, in Cousin’s view, Bodhi’s contribution is fairly cosmetic in the sense of making the text more readable, and of lending more flexibility to certain Pali terms. In this sense he commends BB by making the text approachable to modern readers who are not themselves scholars. This is, however, about the only good thing he has to say of Bhikkhu Bodhi’s work. A lack of clarity as to which source text is being used. BB claims it is the PTS edition, but Cousins doubts this as the text often follows earlier Sinhalese editions that Ñanamoli likely had available. No use of recent scholarship. Many old mistakes are perpetuated, and even some inaccuracies that Ñanamoli had removed are reinstated. Lastly, he notes BB’s uncritical acceptance of the commentarial tradition, something I have harped on in previous posts. As regards the introduction, like Walshe’s for his Digha Nikaya translation (see my review here), Bodhi’s is necessarily fairly basic, but does go further. For example, his discussion of certain critical terms such as dhamma, sankhara, namarupa, etc, is more informative. I always read introductions, but not everyone does–my wife, for instance, will not even read a two page author’s preface. For someone in a rush (though I’m not sure how one would rush through a one thousand plus page book) and who is already well informed on these matters, the introduction is dispensable. Someone more beginning, though, would do well to read it carefully. On the Majjhima Nikaya specifically: This is the second of the five nikayas (“collections”) that make up the Sutta Pitaka (“Basket of Discourses”). In accordance with its title, the 152 suttas (“discourses”) here are not generally as lengthy as those in the Digha Nikaya, though they are often more substantive. The entire teaching, in some way or another, is touched on here, and some of the most important of the Buddha’s discourses are included in this collection. It is repetitious, however, even with the generous editing of repetitive passages. There really is no way around this, though, and readers need to be patient. Not every discourse is a treasure; some are nearly verbatim reruns of previous ones. However, a benefit of this (if one is charitable) is that important issues are more likely to sink in deep; that is, you can begin to get a sense for where the real emphases are in the Buddha’s Teaching. While it is important to be grateful to Bhikkhu Bodhi for his many years of labor on this and other works of translations, I am left scratching my head over why no able team of scholars has ever been put together in the way that Biblical translation teams are. Why is it always a lone translator trying to capture a literature that is many times more voluminous than the Bible? Certainly there are other monks, scholars and interested individuals who could add their talents to the project of translating Buddhist scriptures. It is high time that we stop relying upon the understanding and insight of individuals–always limited, however learned they may be–for our access to these vital documents. The Udana & The Itivuttaka: Two Classics from the Pali Canon translated by John D. Ireland. Buddhist Publication Society 1997. 266 pages. I’m not sure what it says about our world when such a beautiful collection as this is so obscure. Nothing good, I wager. This volume consists of two sutta collections, the Udana, or “Inspired Utterances,” and the Itivuttaka, or “So It Was Said.” Both are part of the Sutta Pitaka’s Khuddaka Nikaya, a heterogeneous collection of works representing some of the earliest materials in the Pali Canon as well as some of the latest. This is definitely one of my favorite Buddhist scriptures. It is not only very readable (particularly in Ireland’s mellifluous and careful translation), but often quite profound; some of the most critical passages concerning the nature of nibbana are found here. It also contains no small measure of humor–the story of Nanda and the pink-footed nymphs (at 3.2) is priceless! There is also a definitely personal element to the Udana. Such stories as Bahiya of the Bark-Cloth (1.10)–an ascetic who interrupted the Buddha on his almsround, got a terse, cryptic dharma talk from the Master and instantaneously became an arhant, only to be gored to death by a mother cow an hour later–have the ring of historical authenticity, so unique are they. I also like the story of Visakha (8.8), who comes to the Buddha weeping and sobbing because her beloved grandchild has died. Despite the pain this one death has inflicted upon her, she admits she would like to have as many children and grandchildren as there are people in Savatthi. The tension between normal societal standards and the Buddha’s teaching of reality are brought here into sharp relief. Other memorable/important/profound moments in the Udana are found at 1.1, 2.4, 3.10, 4.1, 5.1, 5.3, 5.5, 6.1, 6.4 (the famous story of the blind men and the elephant), 6.6, 6.8, 7.1, 7.7, 8.1, 8.3, and 8.4. The book is organized into four sections: The Ones, The Twos, etc. Sometimes this relates to the number of items or points discussed in an individual sutta, but this practice is not consistent. Like the Udana, the topics vary and the arrangement does not take subject matter into account. Verse makes up as much as half of the text. My feeling is that while not as enjoyable to read as the Udana, there is still much to recommend the Itivuttaka. Points of practice (e.g. asubha bhavana and loving kindness) are touched on, mental tendencies (conceit, diligence, anger, craving etc) discussed, and important doctrinal issues revisited (nibbana and the four noble truths). The two works complement each other, and for anyone wanting to study the Buddha’s teaching from the original sources, this two-for-one volume is a must have. Highly recommended.